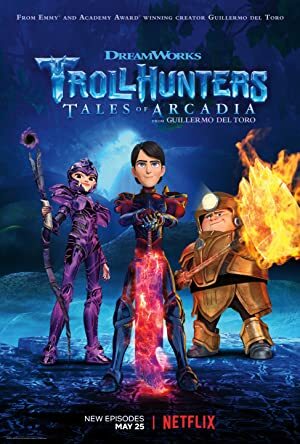 Trollhunters – Season 2 (2017) – What's New on Netflix Canada Today! Backed by loyal friends, once-ordinary teen Jim Lake Jr. advances his battle to protect Arcadia and the Troll world he’s pledged to keep safe. An ordinary boy finds a magic amulet that turns him into the next Troll Hunter; the champion of both the hidden world of Trolls and his own. Jim Lake Jr. is an ordinary kid with a busy Mom and a yearning to have more adventure in his life. As it happens, Jim gets more than he wished when he finds a magic amulet under a bridge.calling to him. With that discovery, Jim finds himself recruited as the next. and first human, Troll Hunter, the champion of the Troll world. Together with his friend, Toby Domzalski, Jim discovers the world of Troll Market, where he begins his training under the tutelage of his new mentors, Blinky and AAARRRGGHH!! !, who also tell him of the threat of the Gumm Gumms, who scheme to release their leader, Gunmar the Black, to conquer both the Troll and Human worlds. In the struggle ahead, Jim and his friends will discover enemies and friends where they least expect them as their shadow war draws ever greater danger and complications into all their lives.